Colour changing display for maximum safety. Measurement is carried out by means of an ion-exchange method. 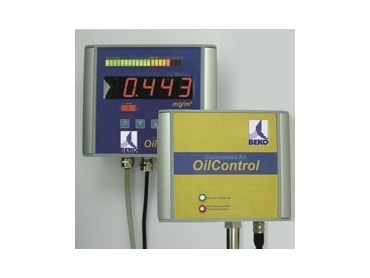 The sensitivity of the Oil Monitoring System guarantees an early detection of any increase in the oil content, avoiding potential damage to machinery, products, even health and the environment. Moreover, you no longer need to take samples and wait for the results of the analysis. Your use of compressed air as production utility gains in reliability the purchase cost of an OilControl monitoring system is easily recouped especially when compared with the costs of lost production. The BEKO range of brands includes all aspects of economical, safe and ecologically responsible use of compressed air. With their diverse capabilities, all the product groups meet the demands from individual components right up to those of a complete large-scale system.